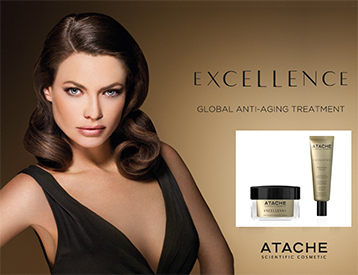 The latest discoveries in Cosmetic Science by ATACHE Scientific Cosmetic. The Telomeres activators help in prolonging the youth skin cells and delaying the onset of the ageing process. From this, the ATACHE Excellence range was born. An anti-ageing home care treatment for night use, it gets to work intensively while you sleep. It helps the skin’s natural nocturnal renewal and repair cycle, providing additional support needed for deep down regeneration and revitalization overnight. 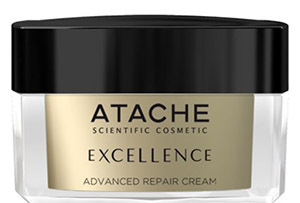 Advanced Repair Cream offers innovative blend of Vitasource™, the ingredient which enhances Telomerase production and Phytessence Holyherb™, a powerful DNA protector and repairer, both of which act to delay the onset of cellular aging, thus providing new life to the skin during the night. It also includes Soya Glycopeptides, high purity Collagen I synthesis activators, which increase the concentration cell renewal, bringing back the suppleness and smoothness of young skin. It provides a smoothing effect to the skin’s micro – relief, reducing wrinkle depth.